Funding for the marketing order is provided by a producer approved assessment of two cents per bushel, which is collected by the first handler. The assessment typically generates about $670,000 annually from the state’s wheat producers. The “Colorado Agricultural Marketing Act of 1939” and the “Colorado Wheat Marketing Order” require that assessment funds be used for sales promotion, public relations and educational programs to increase the consumption and utilization of Colorado produced wheat. Research programs, which improve the marketing and utilization of Colorado wheat, are also authorized. A delegation of flour millers and wheat buyers from the Philippines and a representative from U.S. Wheat Associates visited Colorado in August 2010 to learn more about U.S. wheat production, wheat marketing, and the quality and quantity of U.S. wheat. The team, pictured to the left, visited Anderson Wheat Farms near Haxtun. To provide Colorado wheat producers an organization that helps develop, maintain and increase domestic and export sales while supporting education, research and promotional programs designed to increase the consumption and utilization of Colorado wheat. Funded by a producer approved assessment of two cents per bushel. The CWAC Advisory Committee consists of one member and one alternate from each county included in the “Colorado Wheat Marketing Order.” The CWAC Advisory Committee serves in an advisory capacity to the CWAC Board of Control. The Board of Control has the power to conduct the business of the organization, negotiate contracts, establish or adjust rules and conduct and approve other matters incidental to the well being of the marketing order. 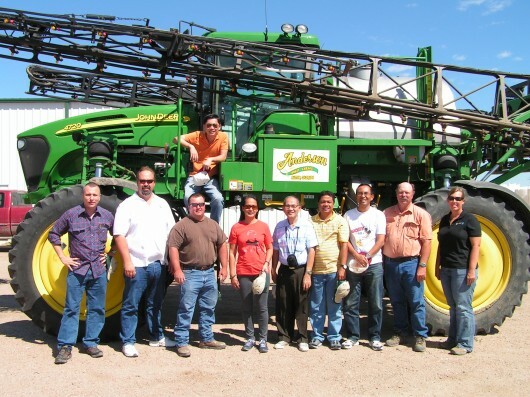 CWAC meets five times a year in conjunction with the Colorado Association of Wheat Growers.